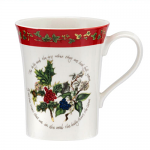 Portmeirion The Holly and Ivy china has been named after the English Christmas Carol of the same name. Each piece has illustrations of holly and ivy with antique flowing script around the pattern. The perfect choice for your Christmas china. Blends well when mixed with Portmeirion Botanic Garden china.